Last year’s blog post about Working Remotely From A Tropical Island in Thailand went viral, with close to 100k people sharing it in just a few days. While we were extremely happy with the feedback we received, it also sets the bar very high for writing this year’s article about our annual two-month company retreat. For those who don’t know it yet, at Mobile Jazz (MJ) we do things a bit differently. 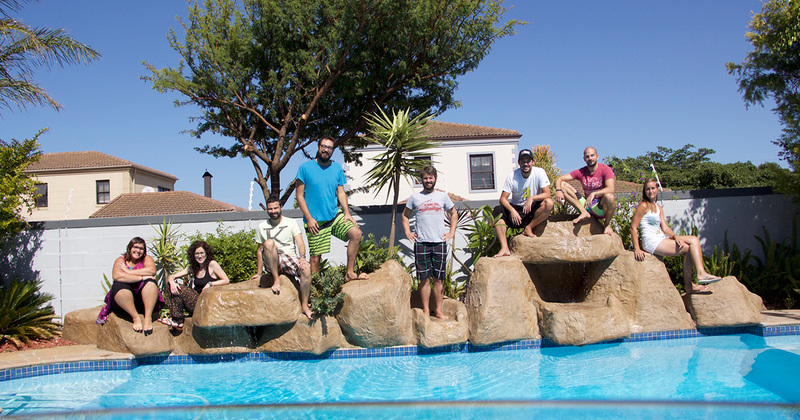 We are a 20-people strong boutique web and mobile app development company headquartered in Barcelona. So far, so good. Sounds like any other company. The difference is that, since inception, our focus has always been on Optimizing For Happiness, rather than profit. Everyone can work from anywhere they like, and work as much as they like – just as long as things get done with the high quality our team and clients expect. Also, everyone earns the same basic salary (which is already very competitive), and on top of that we distribute a big chunk of our profit through a quarterly bonus program. For us at Mobile Jazz work is not only about making money. It is about being surrounded by great people experiencing and sharing a fun life together. The MJ Remote Office, where we escape the cold winters in Europe and head to a more tropical or summery location for one or two months. As mentioned above, one of the main reasons Mobile Jazz hosts the annual MJ Remote Office is to escape the cold European winters. Even in Barcelona, it gets cold in winter time. South Africa is on the exact opposite side of the planet, but in the southern hemisphere. So while Europe and the US are in winter sleep-mode, and people are in “hibernation,” Cape Town is full into summer, with everyone taking advantage of the opportunity to enjoy an outdoor lifestyle. Cape Town – one of the most beautiful cities in the world and a good place to escape to when the cold winters take over the Northern Hemisphere. In addition to that, Cape Town also falls in the same time zone as Barcelona – which was not the case when we escaped to Thailand! And even though many of our clients are in other parts of the planet (including the USA on one side and Middle East, Asia and even Australia on the other side), it makes things easier when we are able to stick to the times we are used to. Another important element for us is having a good infrastructure while we are on retreat. While I personally enjoy adventures and challenges like hiking in the Himalayas, exploring the desert in Oman, and sailing in the South Pacific, when it comes to traveling with our whole team and being responsible for other people, we don’t want to run into difficulties that make setting up in a new location more demanding than it needs to be. In some locations, challenges can be very simple tasks including eating or getting laundry done. When we host retreats, we also want to be in a place where we feel safe and can walk around and explore freely. In spite of what some people say, Cape Town is actually a very safe city, as long as you apply common sense and avoid certain areas. From this perspective, it’s no different than Berlin, New York, London or any other major city. Cape Town provides a quite unique combination of beaches, mountains, and city life. A great place to work, while constantly being reminded that there’s more to life. The place we choose also has to be affordable. And while we’re not looking for super-cheap, we have to say that due largely to the current political mess in South Africa, the Rand (ZAR) has crashed quite a lot compared to the € (EUR) or $ (USD) and consequently made things very affordable for us. Last but not least, we’re not only there to have fun, but also for team building and to get some work done (which can be fun too). Therefore, our most important requirement is to have a fast and stable Internet connection as well as reliable electricity. Having decided on Cape Town for this year’s retreat, one of the major debates within our team was whether we should stay in the city itself or rather get a nice villa somewhere out of town and enjoy nature and an outdoor environment. We ended up renting a beautiful two-story house with a huge garden and swimming pool in Tableview (Map), just 30 minutes outside of Cape Town. As the name suggests, this area has a breathtaking view of Table Mountain. Fran, our web team lead found the place on Airbnb for € 3400 ($3800) for the whole two months, and we immediately fell in love with it (at the time of this writing the price has unfortunately doubled). It accommodates eight people and has a huge kitchen as well as two living rooms. There was also an outdoor seating area in the garden with a braai (the South African name for a BBQ), which we ended up using every other day. “Braaing” is big in South African culture, which focuses on an outdoor lifestyle throughout the year. The villa has 4 bedrooms, 2 living rooms, a kitchen and a huge garden with BBQ and pool. The villa wasn’t right on the beach, but the beach could be reached easily by car. This was an important factor as some of us like to go kitesurfing and others were keen on learning more about it. Supermarkets, restaurants, and a place to practice yoga were also nearby. Cape Town’s city center is a mere 30 minute drive from where we stayed and we went there once or twice a week to have dinner in some of the city’s fabulous restaurants. Internet was a bit of a problem, but at the same time it wasn’t. Landline Internet is really slow in South Africa, unless you’re connected to one of the fiber lines in Cape Town. For us it didn’t work. As soon as there were three people connected, the pipe was full and we couldn’t get any more throughput. We knew about this issue from previous personal travel experiences. As soon as we arrived at the airport we got ourselves 4G SIM cards from Vodacom (one of the three major communications service providers in the country). You get 20GB for 60€, which is not the cheapest, but still a fair price for the speed you get. Considering we need it for work, it’s a relatively small cost factor compared to the other expenses we have. One of the many work areas we had around the house. The cool thing about having 4G is that it doesn’t matter where you work from. It can be outside in the garden, on the upstairs terrace or from a café on the beach. It works anywhere. Getting around in South Africa is easy. Besides the fact that from our perspective they drive on the “other” side of the road (left), things are fairly uncomplicated. We booked our cars a few months ahead and got a great deal with Thrifty for € 7 a day ($7.80). Once you arrive at the airport you just walk out, cross through a tunnel and pick up your car. You do the opposite when you leave. When it came to going out at night, if nobody volunteered to be the designated driver, we simply ordered an Uber, which also costs just a few €. Besides the stories some people might tell you, the truth is, most of it is simply exaggerated. Cape Town is a pretty safe place as long as you apply common sense and avoid certain areas at night. But all the “touristy” and “hip” areas you want to go to are as safe as it can get. Visiting a township at night might not be the best idea though. Still, people in the townships are mostly peaceful and very friendly, but it’s best to visit them with a local guide. We are not running away from the bad guys. Just having fun! Also the locals are very friendly people, irrespective of their skin color. Just treat them as one of your own and you’re guaranteed to make some new cool friends who show you a completely different side of Cape Town that you couldn’t experience just being there as a tourist. The food in South Africa is great. Being so close to the sea you get all kinds of fish and seafood, but also due to the widespread braai (BBQ) culture there is also a huge selection of top quality meat available. There are also excellent vegetarian dishes in many restaurants, even those that don’t cater specifically to vegetarians. In fact, Cape Town is often called the cuisine capital of South Africa, and it competes very well internationally. For those who are in for an adventure, try some local African cuisine or have some game and be surprised by the tastes of crocodile, springbok, kudu and ostrich. Team dinner at Mama Africa. Tasting the flavors of crocodile, springbok, kudu and ostrich. Below are a couple of restaurants we really liked. But there are many more to explore. One thing that is really special about Cape Town, and a must-go for food lovers, is the Neighbourgoods Market at the Old Biscuit Mill (Map). It takes place every Saturday morning from 9am to 2pm and offers a variety of dishes to taste from all over, but especially many from the local African cuisines. Get there early as it is very popular with both locals and tourists and gets crowded very quickly. We went there multiple times and really enjoyed every single visit. It’s probably also the easiest way to bump into locals in a queue at the food stand and make new friends. The food market at the Old Biscuit Mill. Excellent food to eat, beautiful artwork to look at and a great way to connect with the locals. Besides the food market there are many artisanal shops within and around the Biscuit Mill and there are two really cool escape rooms if you’re in the mood for a quite intense mental challenge on a Saturday morning. A similar kind of market is also organized in Big Bay. Although smaller, it follows the came concept, and it’s also a great place to hang around and have a great dinner right on the beach. If you love gin and tonic, you may want to try the local gins. We had the chance to visit the Gin & Tonic Festival and enjoyed local brands of craft gins. It’s important to understand that we were not in Cape Town on holiday, where we could just hang out on the beach all day long. When we go on our remote escapes, we try to continue our regular schedules, with normal work hours, but we focus less on client work and put a stronger emphasis on team building and pushing forward our own product ideas. Like we did with Bugfender, which started as a tiny internal experiment, but has reached by now more than 10k installs all around the globe. When on retreat, we usually start our mornings with a healthy breakfast, which is mostly my responsibility as I really enjoy waking up and taking in some high-energy food in the morning. While in Cape Town, some days (about two or three times a week) we attended a yoga session in our neighborhood, sometimes with local people and sometimes just a private class for our whole team. Then, wherever we are, we usually catch up with emails from clients and from the rest of our team, and try to get all the important things done before midday. Some days it was too hot to work from inside the house. So we moved to a shady spot in the garden or working from the pool was always an option, too. So we found out. We usually prepared lunch ourselves. We didn’t have a real schedule, but there was always someone willing to prepare something, so in the end everyone took their fair share helping with lunch. It was the same for washing dishes and keeping the place clean and tidy in general. While lunch fatigue was kicking in, we usually decided to take a break (we like the Spanish concept of a “siesta”) or refresh ourselves in the pool. During most afternoons, there were often a couple of pool and ice cream breaks as it can get quite hot, which makes it a bit more difficult to focus. That’s also why we usually have meetings and brainstorming sessions in the afternoon, as they keep us awake and also bring back some of the energy. When there was nothing important going on in the late afternoon, we sometimes just called it a day, picked up our kitesurfing gear and headed out to the beach. Catching an Uber to Camps Bay for dinner and to enjoy the sunset. In the evenings, we often went into the city center to have dinner and a few drinks. Many times we also had philosophical discussions or came up with new business ideas. The nights we stayed in, we usually fired up the BBQ in the garden and had a typical South African braai and then a couple of rounds of The Resistance or a movie night afterwards. South Africans as a whole love the outdoors. And so do we. We found there were virtually unlimited possibilities of things to explore and adventures to enjoy. South African wine is world-renowned and fairly affordable. There are tons of vineyards around Cape Town and Stellenbosch that do not only offer wine tasting experiences, but also picnics with great scenery and beautiful backdrops. The South African vineyards are not only for wine tasting, but also to enjoy the lifestyle that comes with it. If you’re really into wine, Fran our web team lead at Mobile Jazz has written up a great review of all the wine farms that he has visited. The Garden Route is one of the highlights of southern South Africa. It is a four hour drive from Cape Town to get there, and it is best to explore during an extended weekend. The Garden Route. One of the most beautiful and scenic areas in South Africa. This beautifully scenic expanse of coast stretches from the Gourits River just before Mossel Bay to St. Francis Bay, 75 km west of Port Elizabeth. Bordered in the north by four majestic mountain ranges – the Langeberg, Outeniquas, Tsitsikammas, and Outeniquas – it boasts a constantly changing sea line, with pristine sandy beaches, lofty cliffs, and wave-battered rocks. It is also a region of magnificent mountains and valleys, spectacularly beautiful passes, dense forested areas, lakes, rivers and estuaries that meander along the coast. Take a kayak up the river in Wilderness combined with an easy hike to a cool waterfall. Hike in the nature reserves around Knysna and have a posh dinner by the lagoon or at The Heads. Snorkel with seals (and hopefully no sharks) in Plettenberg Bay and go on a fantastic hike in the Robberg Nature Reserve. Explore Nature’s Valley, where the Groot (big) River flows into a lovely lagoon. Jump from the highest bridge bungee jump in the world (216 m) off the Bloukrans Bridge that spans the Bloukrans River. Hike the full five day (48 km) or just the beginning of the world famous Otter Trail that starts at the Storms River Mouth, and ends on the Nature’s Valley beach. Surf the big waves with pro-surfers in Jeffreys Bay. Cape Town has some of the best kitesurfing in the world, especially for those who enjoy huge jumps and are into big wave riding. It is also the host of the annual Red Bull King of the Air. This is a spectacular event to watch (and to participate in if you have the balls). Attempting the Kitesurfing Guinness World Record in Cape Town in January 2016. While we were there, it also happened that the Guinness World Record for kitesurfing was smashed with 415 kitesurfers completing a one mile (1.6 km) course, breaking the record – previously held by Spain – for the largest “parade” of kitesurfers. Some of us took part in the event and helped make it the success it was. Kitesurfing is not an easy sport to learn and to say it is not dangerous would be a lie. However, it’s a great new challenge for those who are up for it and very different from sitting in front of a computer all day long! Can’t get much better than that. Our local kite beach with Table Mountain in the background. There are so many opportunities to go hiking in South Africa, and at least two of the best are right there in Cape Town. The path up to Table Mountain is extremely popular amongst tourists and locals. Best to avoid on weekends. Table Mountain is a world famous landmark that you’ve probably seen in many magazines or on National Geographic TV shows. You can either “hike” it the tourist way and take the cable car and stroll around on top (which is best if you want to watch the sunset), or do it the hard way and hike up the steep ravine between the mountain walls and feel like you are part of The Fellowship in Lord of the Rings. There are also less strenuous hikes on the lower reaches of Table Mountain. Whatever you choose, this is a must do. The peak of Lion’s Head provides a 360º view of Cape Town. Lion’s Head, the smaller “brother” of Table Mountain, is situated right next to it. It’s extremely popular with fitness conscious locals who run up there every morning. For mere humans like us, it is an easy one hour hike with the possibility of doing some moderate climbing (no equipment required) on some of the side tracks. It is best to go up there at dawn – you will be rewarded with a beautiful sunrise and a full HD 360º view of Cape Town. The events run by Mobile Jazz are mostly about team building and having a great time with our peers. However, for me, as one of the co-founders of Mobile Jazz, it’s always a great opportunity to meet some new people, build honest relationships, and eventually turn them into new business contracts. After all, we need to make money if we want to continue to support such events. Networking events like the Founders Kite Club are a great way to generate new business opportunities in a fun and relaxed environment. Besides being part of multiple paid networking communities, the Founders Kite Club being one that also had an event while we were there, I get a lot of warm intros from friends who see my Facebook posts and suggest to me that I meet up with a cool guy or girl they know who happens to be in Cape Town at the same time. While in Cape Town, we ended up hosting a couple of BBQs at our house to which we invited all the new people that we had met locally. Almost 50 people came to one of these. It’s a great way to say “thank you” for the help and advice they have given us, but also an opportunity to connect deeper with each of them and shape some real relationships that go beyond that two month visit. The Mobile Jazz Team being interviewed by a local TV station about the pros and cons of remote working and the benefits of applying Optimizing For Happiness in every company. You might think this is maybe too much of a stretch to mix business with personal life. However, we have to say this has worked very well for us. Since we started Mobile Jazz, we haven’t had a single sales person in the company. All our business comes from new people we meet out there in the world, and from existing clients who recommend us to their friends and colleagues. Adam here, I thought I’d chip into this post and give my perspective on how business continued as usual on the home front, and how it was for those who didn’t attend the South African retreat. A total of 12 of our team members visited Cape Town at some point during the two month retreat, which meant there were always a few of us working from the office in Barcelona or at home. The team in Cape Town connecting with the HQ in Barcelona and other remote team members in Brazil, Mexico, Germany, Italy, Dubai and Bali. Out of our team of 20, the Barcelona office usually only sees around five to ten people on any given day, so we’re used to working without everyone around. We use Slack as a virtual office. When we start work, we log in and let the rest of the team know where we are and what we’re up to. When we’re finished for the day, we’ll always leave a message to let everyone know. From this respect, it was no different to any other time: everybody knew what everyone was working on and we could communicate exactly the same way as we always do. Cape Town is on the same time zone, so there was no confusion or delays in communication. During the retreat, we continued to have our Monday morning hangouts, where the whole team gets together, aligns for the week and shares a recent experience (we had some very insightful, interesting and some hysterical ones!) Although I was a little jealous of the hot weather, BBQs and pool parties the remote team was having, it was absolutely fantastic to hear about the adventures and mischief they were up to. The Mobile Jazz headquarters in Barcelona looks deserted as everyone is out working remotely from all around the world. As I mentioned above, we’re used to not working side by side, so it literally made no difference to me if a teammate was on the other side of the city or more than 10,000 km away. The remote team was as efficient as always, projects were continued, and tasks were completed. All-in-all I found there was virtually no difference with our communication, productivity or quality of work. When the team returned, it was fantastic to see them relaxed and refreshed which also brought a really positive vibe to the office. Discussions have already started on the location and activities for the next retreat and I can’t wait to be a part of it. We were flying straight south so there was no jet lag, which was great! It was the same on the way back. Having a proper house with all amenities helps a lot. Our host was also extremely helpful. And while things are different in Africa, our experience was not as difficult as it was in Thailand, where people tend to say “yes” to everything you ask for, but you can wait forever for them to happen. With eight people in the house you can’t always do everything together. People have their own interests and sometimes someone just wants to take a break and read on their own. Also some people joined with their spouses and it’s nice to have some private time once in awhile. So we learnt to respect everyone’s interests and rhythms. In the South African summer, it gets hot in the afternoon. A house with A/C would have helped. That said, we don’t really like A/C. Landline internet is like terribly slow. Luckily mobile Internet (4G) is blazing fast and relatively cheap. We’re a service business so our clients sometimes have special demands that we need to fulfill and these can mess up our personal plans. But on the other hand we get to work from a beautiful remote location for two months. Many of us know each other only from Google Hangout calls and Slack. These events are great opportunities for remote teams to build relationships at a very deep level. It’s also an excellent boost of motivation and morale. Planning and communication is key to making this type of experience a success. When writing this blog post, it’s already May and we’ve done so many more cool things that I can’t even find the time to catch up with all the blog post writing I’ve got to do. Right after Cape Town we went on a full week of skiing in the Austrian Alps and had a blast. And I’m writing all this right now from a beach café in Bali, where I met up with Fran (our web team lead) and his wife Sofie who are on a trip around the world exploring remote work opportunities in many different countries. Next up is the Mobile Jazz Summer Camp in Spain in August to be followed by the next MJ Remote Office to the Caribbean on the beautiful island of Martinique this upcoming fall. If you enjoyed reading this story and would like to hear more from us and our adventures of working remotely, sign up for our newsletter right below. We send out only interesting stuff, no spam. We promise.